The most recent quarter provided more angst than returns for the Hodges Funds, as stocks bounced around in a fairly tight range for much of 1Q17. Following strong gains in the final quarter of 2016, investors spent a good deal of the first quarter of 2017 working through the negatives and positives associated with much of the policy rhetoric coming out of Washington DC. At Hodges Capital Management, we are maintaining our cautiously constructive stance on the growth and regulatory environment for most domestic businesses. As the prospects for earnings improvement in 2017 appear likely for many U.S. companies, we see value and growth opportunities in many of the cyclical areas of the market such as financials, consumer discretionary, technology, and industrials, whose earnings have been stagnant over the past couple of years due to sluggish growth in the U.S. economy. By contrast, we see less long-term opportunities in utilities, telecom, and consumer staples which had benefited the most from low interest rates and a flight to perceived safety in recent years. ** The Advisor has contractually agreed to reduce its fees and/or pay Fund expenses until at least July 31, 2017 and July 31, 2018 for HDPMX. Investors pay the net expense ratio. Performance data quoted represents past performance and does not guarantee future results. The investment return and principal value of an investment will fluctuate so that an investor's shares, when redeemed, may be worth more or less than their original cost. Current performance of the funds may be lower or higher than the performance quoted. Performance data current to the most recent month end may be obtained by calling 866-811-0224. The funds impose a 1.00% redemption fee on shares held for thirty days or less. Performance data quoted does not reflect the redemption fee. If reflected, total returns would be reduced. The returns shown for HDPCX were achieved during a period of generally rising market values. Investors should not expect that such favorable returns can be achieved consistently. Although the coming structural changes to the business landscape in the U.S. are difficult to ignore, we are not attempting to forecast or market-time interest rates, currency fluctuations, or commodity prices. Instead, we believe this is an ideal time to scrutinize the fundamentals of individual companies. Although not true for every company, we see many of the headwinds for earnings of the past two years subsiding as input costs stabilize, consumption improves, and the likelihood that corporate tax reform could boost profits, as well as increase capital investment in businesses of all sizes. As always, we are making a conscious effort to remain objective and open-minded in our buy and sell decisions, while continuously looking for new opportunities around every corner. Although many areas of the U.S. equity market appear fully valued, we believe that there are still opportunities to invest in great businesses that are trading at bargain prices in segments of the market that are out of favor or simply misunderstood by Wall Street. At the end of the first quarter of 2017, U.S. equity valuations remain in check with the S&P 500 Index trading at 17.6X forward earnings estimates according to FactSet. The inverse of this multiple is an earnings yield around 5.68%, compared to the 10-year treasury yield of 2.40% at quarter end. We believe this risk premium indicates that the potential reward for holding stocks still outweighs the underlying potential downside risk. The research team at Hodges Capital Management has continued to rigorously gather and analyze firsthand information from a broad scope of publicly traded companies, which has resulted in a few worthwhile observations. First, most management teams seem more optimistic regarding the prospects for demand growth, pricing power, margin improvement and earnings growth compared to a year ago. Second, corporate balance sheets remained generally in good shape, allowing many companies to reinvest in capital projects, make strategic acquisitions, buy back shares, and historically pay dividends. While we invest in individual companies, not stock markets, we can’t help but point out that most individual and institutional investors still remain underweight equities following a prolonged period of outflows from domestic equity funds. At the same time, there has been a meaningful decline in the number of listed stocks in the U.S. as fewer smaller companies are going public while merger and acquisition activity reduces the number of publicly traded companies. According to a recent Global Financial Strategies Report published by Credit Suisse, the number of U.S. listed companies has decreased by roughly 50% from 1996 through 2016 as the number of delisted stocks outstripped the number of new listings by 3,650 companies. This is likely the function of the cost and regulatory environment outweighing the need for smaller companies to access the public markets in a low interest rate environment. As a result, the supply of publicly traded stocks has fallen, while the surviving publicly traded companies on average tend to be more established and profitable businesses that are more capable of paying out dividends and returning cash to shareholders through share buybacks. While not every facet of the U.S. stock market appears rosy, we maintain that current conditions provide opportunities to buy individual stocks with good potential relative to their underlying risk. During the first quarter of 2017, the Hodges Small Cap Fund experienced a loss of 2.28% versus a gain of 2.47% for the Russell 2000 Index. After experiencing a strong quarter of positive relative performance in the Fourth quarter of 2016, the Fund lagged in the first quarter of 2017 due to the fund’s overweight exposure in industrial and consumer discretionary stocks that underperformed the Russell 2000. Despite disappointing performance in the recent quarter, we believe the Hodges Small Cap Fund remains well diversified across industrials, transportation, financial services, technology, and consumer-related names, that we expect could contribute to the Fund's long-term performance. The Fund has recently taken profits in several stocks that appeared fairly valued relative to their underlying fundamentals, and established several new positions that we view as having an attractive risk/reward profile. The total number of stocks held in the Fund at the end of the quarter was 62 compared to 66 at the beginning of this year. Top ten holdings at quarter-end represented 28.42% of the Fund's holdings and included RSP Permian (RSPP), Texas Pacific Land Trust (TPL), JetBlue Airways (JBLU), Hilltop Holdings (HTH), Encore Wire Corporation (WIRE), Group 1 Automotive (GPI), Cooper Tire & Rubber Company (CTB), Kapstone Paper & Packaging (KS), LegacyTexas Financial Group (LTXB), Casey's General Stores Inc. (CASY). While the nature of small cap investing can provide opportunities for active portfolio management in just about any type of market, we view the current environment as an advantageous period for active stock picking within the small cap segment of the market. However, small caps (as measured by the Russell 2000 Index) underperformed the broader market (as measured by the S&P 500 Index) in the recent quarter, experiencing gains of 2.47% and 6.07% respectively. Moreover, we expect small cap investing to require a greater degree of individual stock selection and are now focusing on a number of areas within the small cap universe that in many cases are underfollowed or ignored by larger institutional investors. In the current environment, we expect merger activity to pick up as larger companies seek to grow by acquiring smaller businesses that can complement or expand their addressable markets. In our opinion, small caps may also be in the best position to benefit from corporate tax reform as they tend to have more simplistic capital structures and exposure to the domestic economy. For the most part, we expect these factors to support valuation multiples for small cap stocks. The Hodges Fund's first quarter 2017 return amounted to a loss of 0.51% compared to a gain of 6.07% for the S&P 500 Index. The Fund achieved a 30.64% gain over the past twelve months has amounted to compared to 17.17% for the S&P 500 index. Negative relative performance in the recent quarter was attributed a correction in several of the Fund’s industrial and energy names, which had contributed to the Fund’s outperformance in the previous quarter. Despite the uncertainty surrounding many economically sensitive areas of the market, we believe several of the Fund’s energy, technology, and consumer discretionary stocks hold the potential for upside over the next twelve to eighteen months. The Hodges Fund remains focused on investments where we have the highest conviction. The number of positions held in the Fund at the end of the recent quarter was 51, which was down from 62 positions at the beginning of the year. During the first calendar quarter of 2017, we took profits in a few stocks that appeared to offer less additional upside potential relative to their downside risk, increased the size of several positions in which we remain convicted, and entered into several new positions. For example, the Hodges Fund took profits in its remaining portion in AH Belo Corp. (AHC) and exited its stake in G-III Apparel(GIII), while adding to or entering into new positions such as investment bank, Houlihan Lokey (HLI) and enterprise cloud platform solutions provider, Nutanix (NTNX). The top ten holdings at the end of the quarter included Texas Pacific Land Trust (TPL), Ring Energy (REI), American Airlines Group (AAL), Gogo (GOGO), Matador Resources Company (MTDR), Micron Technology, Inc. (MU) , J.C. Penney (JCP), FaceBook, Inc. (FB), Freeport-McMoRan, Inc. (FCX), and Controladora Vuela Company (VLRS), which represented 39.86% of the Fund's holdings. The Hodges Blue Chip Equity Income Fund experienced a gain of 6.57% in the first quarter of 2017 compared to a gain of 6.03% for the Russell 1000 Index. Solid performance relative to the benchmark in 2016 reflected strength among several of the Fund’s high quality stocks, such as Facebook (FB) and Philip Morris (PM). Looking ahead, we seek to find plenty of attractive high quality blue-chip stocks that offer upside potential in addition to dividend income as stable corporate profits support the ability of companies to pay out dividends. The Blue Chip Equity Income portfolio remains well diversified in companies that we believe can generate above average income and total returns on a risk adjusted basis. Top ten holdings at the end of the quarter represented 42.46% of the Fund's holdings and included The Home Depot, Inc. (HD), Microsoft Corporation (MSFT), Facebook (FB), General Electric Company (GE), Apple (AAPL), Johnson & Johnson (JNJ), EnLink Midstream (ENLC), Eli Lilly and Company (LLY), Boeing Company (BA), and Taiwan Semiconductor Manufacturing Co. Ltd (TSM). The Pure Contrarian Fund stands out as our best performing fund over the past twelve months that ended March 31, 2017 generating a 39.30% return compared to a return of 17.17% for the S&P 500 Index. However, the Fund underperformed in the recent quarter experiencing a loss of 3.63% versus a 6.07% gain for the S&P 500 Index. Lagging relative performance in the most recent quarter was largely attributed to a significant correction in several of the out-of-favor energy and consumer discretionary stocks within the portfolio. The two largest contributors to the funds lagging performance were Lonestar Resources (LONE) and Atwood Oceanics (ATW), which in the recent quarter declined 33.96% and 31.78, respectively. Although timing a recovery in contrarian stocks can be tricky over short periods of time, we believe this strategy could be rewarding over a long investment horizon. We also expect this strategy to be less correlated with the broader market due to the general nature of contrarian investing. During the recent quarter, we continued to position the Fund in out-of-favor investment opportunities that we believe offer the best upside relative to their downside potential. Top ten holdings included Controladora Veula (VLRS), Comstock Resources (CRK), Cliffs Natural Resources (CLF), Chico’s FAS (CHS), Gogo, Inc. (GOGO), Ring Energy, Inc. (REI), American Eagle Outfitters, Inc. (AEO), Bank of America Corporation (BAC), Cemex SAB de C.V. (CX), and Horizon Pharma plc (HZNP). The top 10 stocks in the Fund at the end of the quarter represented 46.30% of the Fund's holdings. 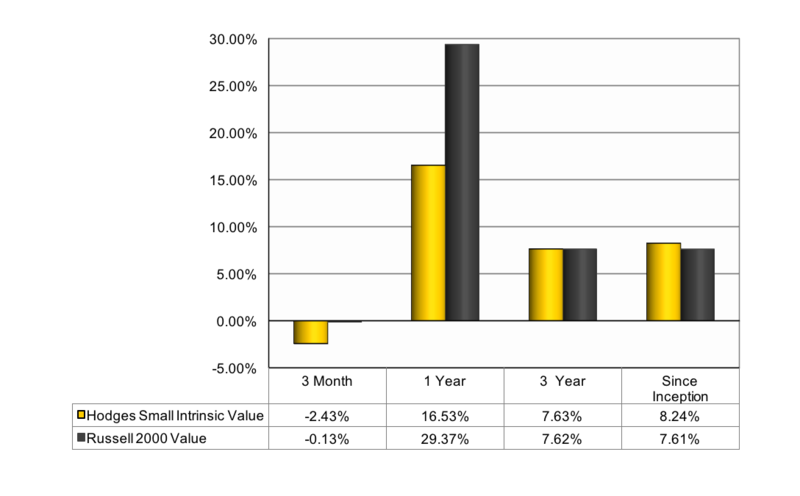 The returns shown were achieved during a period of generally rising market values. Investors should not expect that such favorable returns can be achieved consistently. 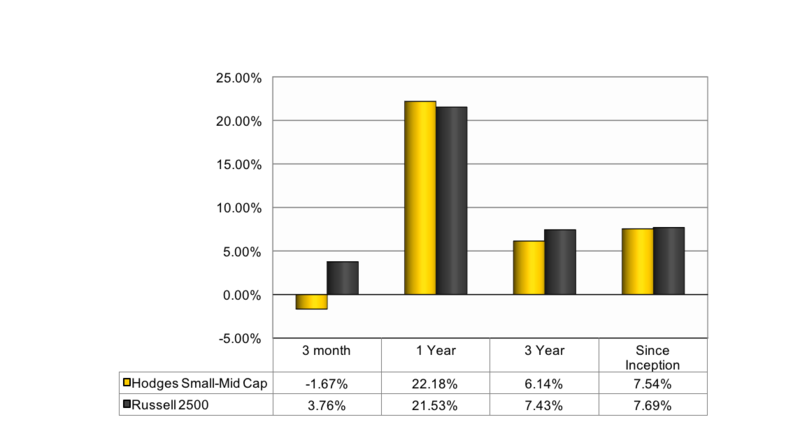 For the first calendar quarter of 2017, the Hodges Small-Mid Cap Fund experienced a loss of 1.67% compared to a gain of 3.76% for the Russell 2500 Index. The Fund’s unfavorable relative performance was attributed to weakness in a handful of stocks tied to energy and natural resources. The top ten holdings at the end of the year represented 36.65% of the Fund's holdings and included Veritex Holdings (VBTX), WPX Energy (WPX), Norwegian Cruise Line (NCLH), O’Reilly Automotive Inc. (ORLY), Whirlpool Corp. (WHR), Murphy USA, Inc. (MUSA), Patterson Companies, Inc. (PDCO), D.R. Horton, Inc. (DHI), Kirby Corporation (KEX), and Foot Locker (FL). The Hodges Small Intrinsic Value Fund experienced a loss of 2.43% in the March quarter compared to a loss of 0.13% for its benchmark, the Russell 2000 Value Index. The Fund’s lagging relative performance in the recent quarter was largely attributed to the Fund’s overweighted exposure to several consumer discretionary stocks, which significantly underperformed relative to the broader market in the recent quarter. The top ten holdings at year end represented 29.02% of the Fund's holdings and included Triumph Bancorp (TBK), Forterra (FRTA), LGI Homes, Inc. (LGIH), TriState Capital Holdings, Inc. (TSC), Kansas City Southern (KSU), Group 1 Automotive, Inc. (GPI), Controladora Vuela Company (VLRS), Veritex Holding (VBTX), Blue Bird (BLBD), and Tower Semiconductor (TSEM). The 10 year treasury is a debt obligation issued by the United States Treasury Department with a 10 year maturity. It is the most popular type of US Treasury debt and is often used as a barometer for the overall U.S. economy. The S&P 500 Index is a broad based unmanaged index of 500 stocks that is widely recognized as representative of the equity market in general. The Russell 1000 Index is a subset of the Russell 3000 Index and consists of the 1,000 largest companies comprising over 90% of the total market capitalization of all listed stocks. The Russell 2000 Index consists of the smallest 2,000 companies in a group of 3,000 U.S. companies in the Russell 3000 Index, as ranked by market capitalization. The Russell 2500 Index consists of the smallest 2,500 companies in a group of 3,000 U.S. companies in the Russell 3000 Index, as ranked by market capitalization. The Russell 3000 Index is a stock index consisting of the 3000 largest publically listed companies, representing about 98% of the total capitalization of the entire U.S. stock market. You cannot invest directly in an index. The Russell 2000 Value Index measures the performance of small-cap value segment of the U.S. equity universe. It includes those Russell 2000 companies with lower price-to-book ratios and lower forecasted growth values. The Russell 2000 Value Index is constructed to provide a comprehensive and unbiased barometer for the small-cap value segment. The Index is completely reconstituted annually to ensure larger stocks do not distort the performance and characteristics of the true small-cap opportunity set and that the represented companies continue to reflect value characteristics. It is not possible to invest directly in an index.